The masters at CAO love to craft premium cigars with their fan base in mind. CAO MX2 is uniquely created for the connoisseur who really enjoys a dark Maduro cigar. Featuring not one, but two well-fermented wrappers, a Connecticut Broadleaf and a spicy Brazilian. Each of these hand-rolled premium cigars are produced individually using zesty Brazilian binders infused with a sensational blend of choice tobacco fillers from five different regions, Nicaragua, Honduras, Dominican Republic, and Peru. CAO MX2 premium cigars are medium to full-bodied, giving a slightly sweet taste upon every draw that’s layered with rich, intense and vibrant flavors. 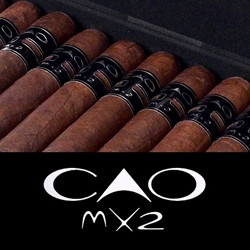 If you love an excellent dark Maduro cigar, you’ll love CAO MX2. Stock up your humidors today with these masterpiece handmade cigars. We here at Smokers Discounts can bring these premium cigars right to your doorstep. A variety of sizes and flavors are listed below at our discount online cigar store. Each of these styles are in stock and available. Call us for more details!